They were the best days of the Soviet Union. The USSR had endured Stalin and existential war, but from the launch of Sputnik in 1957 the feats of the Soviet space programme did not just make the vast nation stand proud, the entire world was bedazzled too. World-firsts just kept coming - a dog in space, a photo from the far side of the Moon, a man in space, a woman, a spacewalk, machines soft-landed on the Moon, probes to the planets... London's Science Museum now hosts an exhibition that includes objects that have never before left Russia (except, in some cases, to orbit), and tells an extraordinary story that extends beyond the Space Race. The show also reveals a Soviet space aesthetic that may sometimes seem Dan Dare-ish, but ultimately traces back to the Russian avant-garde of the early 20th century. 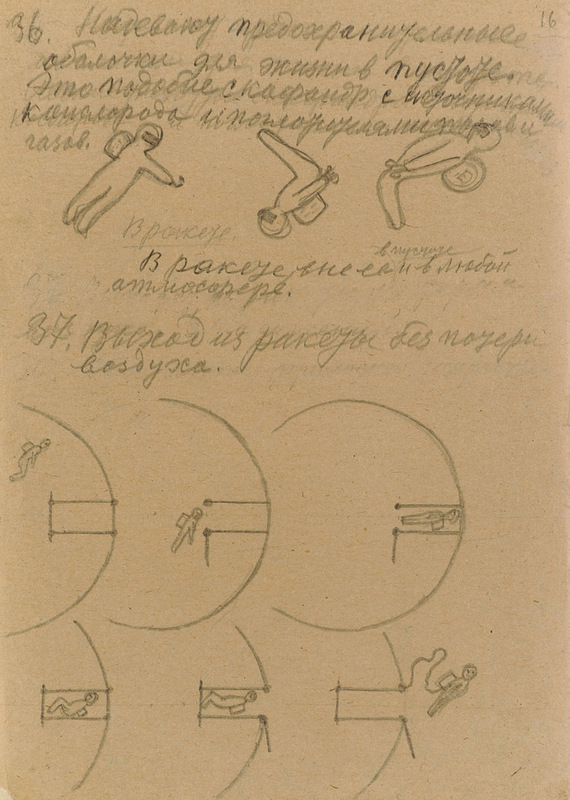 Russia's dreams of space began with Konstantin Tsiolkovsky, who by 1911 had published the basic ideas for space launches, such as the required escape velocity and multistage rockets. At the exhibition's start, we see his rare, prophetic Thirties' drawings of people in zero gravity and an interior for a manned rocketship, made for Vasilii Zhuravlev's film 1935 Cosmic Journey, and clips from the film. But surprisingly, the first object on show is Ilya Chashnik's 1923 painting Suprematism, clearly referring to Malevich's artistic concept. Its row of parallel rectangles overlaid on a long strip could, at a stretch, evoke the solar-panel arrays on space stations like the Eighties' Soviet Mir. The exhibition designers Real Studios (whose portfolio includes David Bowie Is) makes the connection between the early 20th-century Russian avant-garde and Soviet space culture, not just through the early semi-mystical Russian 'cosmism' movement, but even in the look of the spacecraft. Designer Mike Hayes suggests that Sputnik 'looks like a constructivist object', but Stalin, of course, preferred 'socialist realism'. It is that aesthetic which we see in the stirring posters with which the USSR proclaimed its early space achievements (and which saw supreme expression in Moscow's sublime, sweeping, 110m-high Monument to the Conquerors of Space (1964) by Faidysh-Krandievsky, Kolchin and Barshch). Sergei Korolev, the engineer imprisoned by Stalin who would lead and inspire the Soviet space effort, is rightly honoured. After masterminding the USSR's intercontinental ballistic missiles, he pushed through the first Sputniks (a replica of Sputnik 3 is on show). From 1958, he led the manned programme that would put Gagarin in orbit in 1961. On show among the craft, equipment and artworks is a medical student's coat from that year, crudely scrawled with KOSMOS NASH (Cosmos is Ours) and a red star - quite punkish, contrasting with but echoing posters of glory. A highlight is the actual Vostok 6 re-entry capsule of the first woman in space, Valentina Tereshkova. The charred globe with its great circular aperture is a treasure (and its form would find echoes in the EVA pods in Kubrik's 2001: A Space Odyssey, and even George Lucas' Death Star). Korolev went on to lead the Soviet effort to put a man on the Moon, a programme kept secret until 1988. 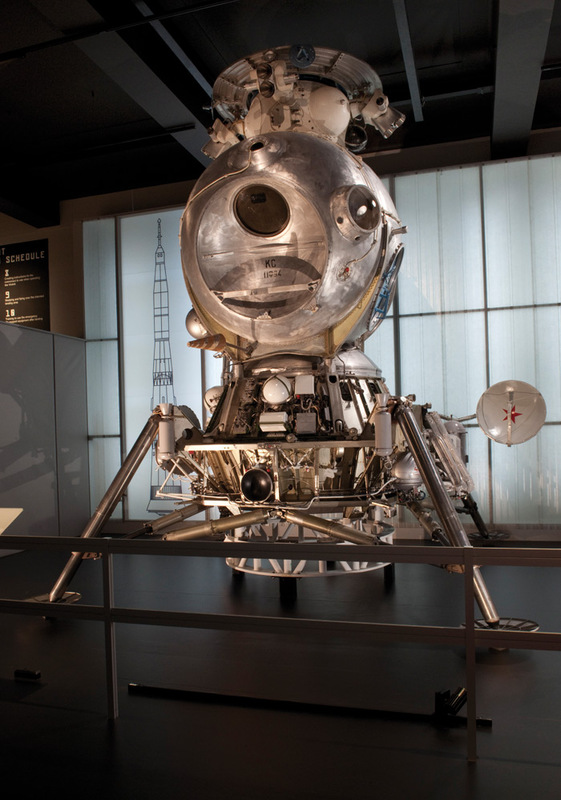 The Science Museum's most stupendous surprise is a 1969 engineering (full-scale) model of their LK-3 lunar lander, which could have made Alexei Leonov the first man on the Moon. This wondrous, silvery craft, essentially a spherical cabin mounted on a rocket and legs, is slimmer and smaller than the Apollo lunar module (see for yourself: there's a replica of it on the museum's ground floor). Apparently, the LK-3 hadn't been moved for so long that a tree had grown in the building's access door. However, for sprouting less aerials, it looks like the one that Moscow's Muzei Kosmonavtiki displays - but that's only a small-scale model. Nearby is a replica of the Heath Robinson-esque Lunokhod rover from 1970 (compared then to a bath-tub with wheels). But after Korolev died in 1966, the Soviet space programme was faltering. The Americans were catching up fast. It's curious to see Kennedy's 1962 'We choose to go to the Moon' speech playing, when footage of early cosmonauts would have been better (still, the permanent display downstairs does offer a whole wall about Gagarin). From after the Soviet winning streak, there's some interesting kit to see, such as the chunky 1983 Soyuz Neptune control panel with unfeasibly numerous keys, and then the show seems to jump to the International Space Station. There is no mention of Galina Balashova (Blueprint 342), architect for Soyuz, space station Mir, and the Buran shuttle, nor the Buran itself (abandoned after just one flawless unmanned orbital flight in 1988). The final room restores awe and surprise. In 1969, a mannequin with the face of Gagarin circumnavigated the Moon in Zond 7, and it sits centrally in a bare, blue-lit room, as strange as 2001: A Space Odyssey's penultimate hotel-room set. Cosmonauts has gaps, but it is the epic show it promises to be. From Russian avant-garde to priceless spacecraft relics and stirring graphics from days that were never more heroic, this is a cosmic parade.